I grew up watching ’80s teen movies and sitcoms–things like Fast Times at Ridgmont High or Saved By The Bell–and they all created the impression that California was this sunny mecca of palm-tree filled mall atriums and penny fountains, that the west coast was where the mall truly came from, the rest of the country was just trying to horn in on their sun-spackled glory. Almost four years ago, I moved to California. I then realized that we not only have fewer malls than most other developed parts of the country, but that (with the notable exception of the immediate Los Angeles area) they’re a lot more secondary to American life than they are in most other places. Weirdly, the place that got far more of these concrete palaces is the less-glamorous rust belt.Pennsylvania, in particular, has a mall, or two, or three, in nearly every community of significant size. 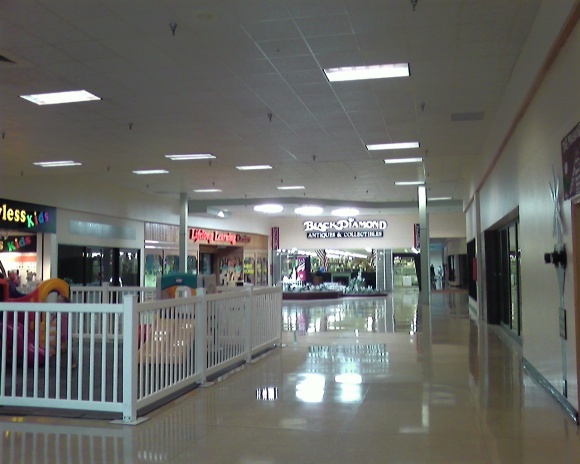 This mall, the Schuylkill Mall in Frackville, is one of three enclosed malls along a rural stretch of PA route 61 in east-central Pennsylvania. 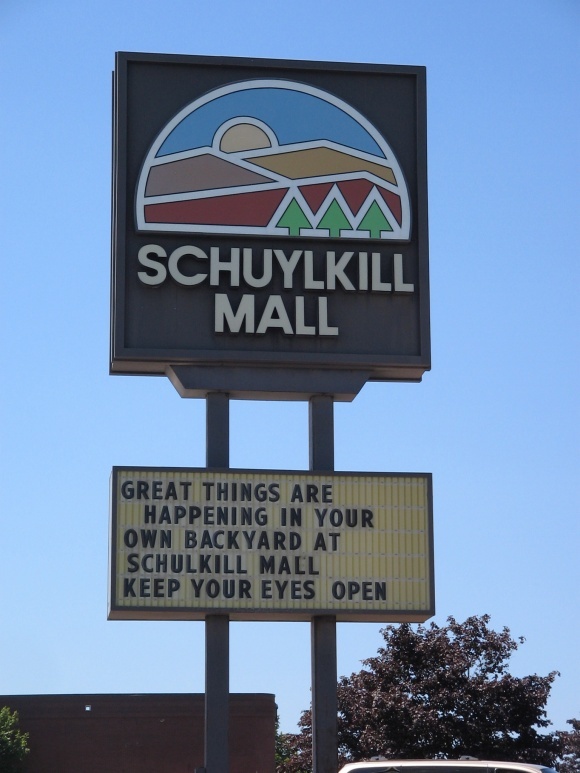 The Schuylkill Mall opened in 1980, developed by Crown American properties, with Kmart, Hess, Sears, and Pomeroy’s as anchor stores. 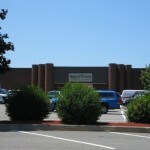 With around 800,000 square feet spread across a “T” shaped pattern, the mall was extremely large, especially given its rural trade area, and initially opened with a bevy of mid-range national tenants including Gap, Deb Shops, Spencer Gifts, Record Town, Jeans West, Foxmoor, Fashion Bug, B.Moss, Waldenbooks, Claire’s Boutique, Afterthoughts, Listening Booth, Slack Shack, KB Toys, and Footlocker. 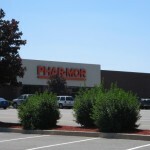 In 1987, a fifth anchor–Phar-Mor–opened on the mall’s north side to complete the roster, and that same year Pomeroy’s was sold off to The Bon-Ton, and the store changed nameplates to what it is today. 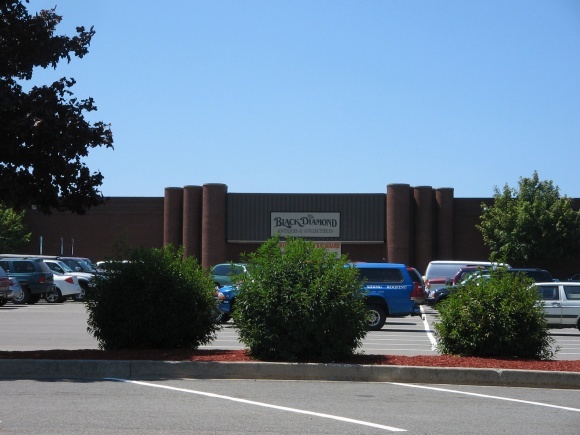 For much of the 1980s and 1990s, this fairly dark and brown center was the dominant retail draw in the region, far dwarfing the two smaller malls south of it along route 61. 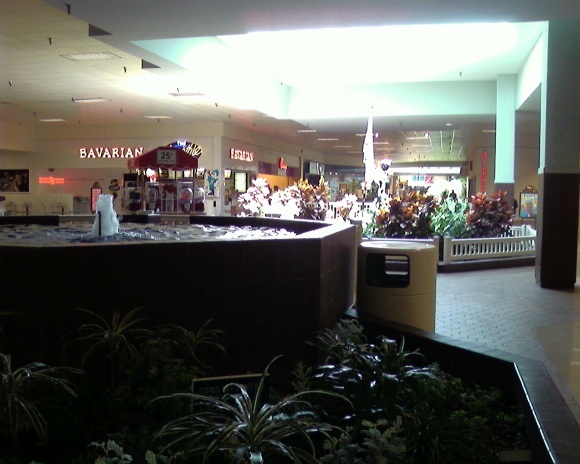 The Schuylkill Mall was never a fancy place. This part of Pennsylvania is rustic and blue collar, known for coal mining and industry. In fact, this area’s biggest claim to fame is nearby Centralia, a ghost town sitting atop an underground coal mine fire that has been burning since 1962. 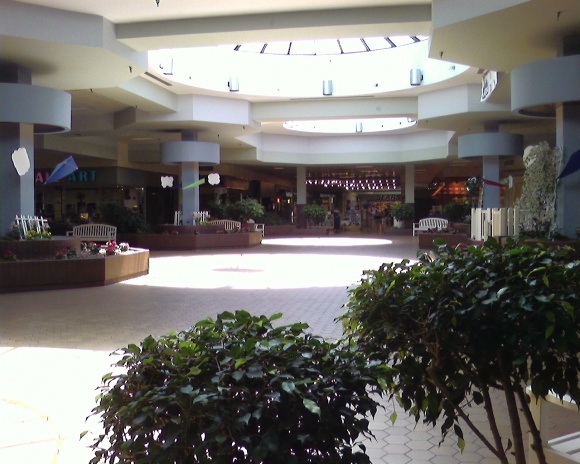 Despite this, the mall has always been at least somewhat successful and never exactly dead throughout its existence, serving as a mid-range catch-all for people living miles in every direction. Hess’ closed their store at some point–possibly 1994 when the entire chain went belly-up–and their store was replaced by the Black Diamond Antique Mall, which occupies the space until today. 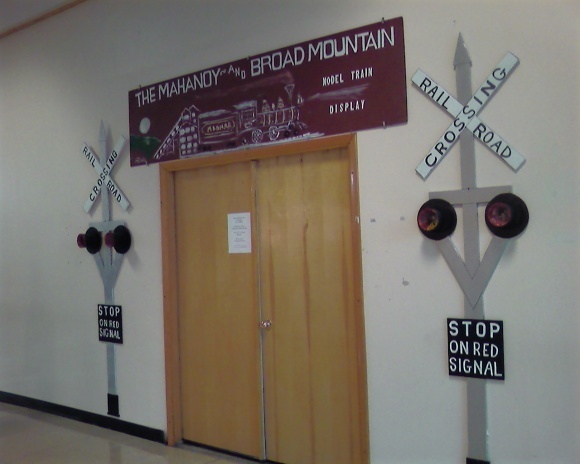 Much of the wing leading to it has died out, and what few stores exist are somewhat temporary/lower tier operations (including a model railroad club!) 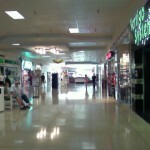 In 2003, Crown American merged with PREIT, who is the current owner and operator of the mall. 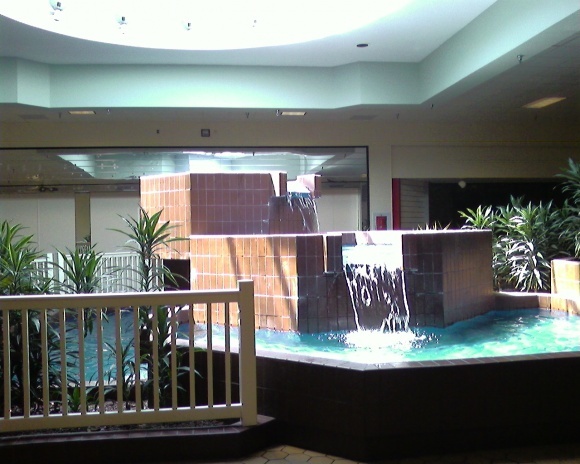 I visited the Schuylkill Mall twice, in 2004 and 2007, and took this set of photos on the latter date. 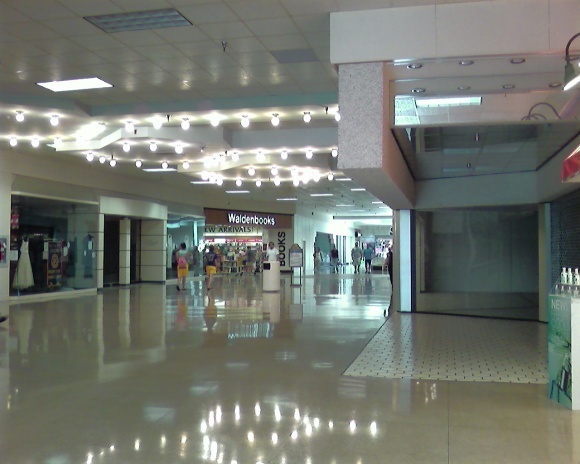 Although the mall’s condition was around the same during those two visits three years apart–i.e., not great, but still with a fair amount of activity and national tenants–several accounts have noted that the mall’s fortunes have declined precipitously in the last several years, with many national tenants such as Kay Jewelers, Claire’s, Chik-Fil-A and Waldenbooks (duh) closing their stores in the mall. 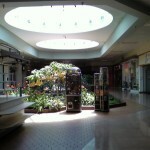 What’s perhaps most interesting about this odd, beat up mall is its condition. It appears like it has gotten little love or attention since its 1980 opening, with its dated, primary-color logo and triangular planters hanging on like a hawk’s talons to a rat. Or something. Do you know what’s going on with this mildewy palace on the hill? Its not necessarly dying Pharmor is now Black Diamond Antiques. Which mind you is amazing also fairly busy on a regular basis mainly the weekends. 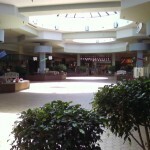 My husband and I live in Selinsgrove, PA and our mall is kinda bland and dying. This one is an odd unique that we enjoy. 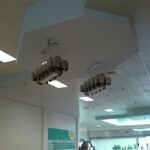 They shouldn’t have taken the chic-fil-a out though have to go to Berkshire mall for them now. As avid mall hoppers as my husband and I are we enjoy this mall the most… and we are in our early 20s. This is our Bergen Mall (before is was renovated) nostalgia and people all the same. 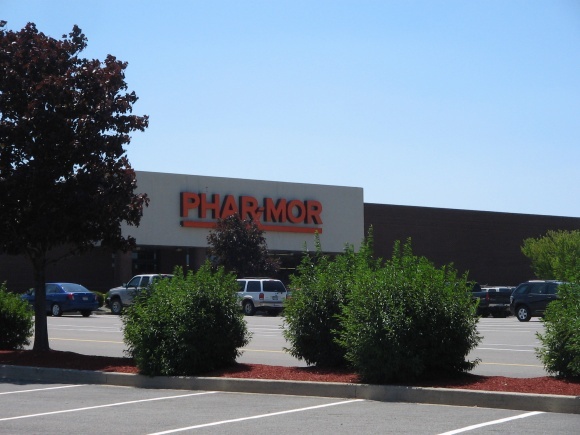 So, why do Black Diamond Antiques and Phar-Mor appear to have completely different facades? 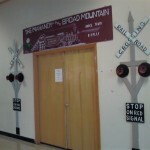 @Pseudo3D, Black Diamond wasn’t in the Phar-Mor space at the time these pictures were taken, but they have since relocated to that spot. I wouldn’t label Susquehanna Valley Mall dead. Bland? Absolutely, but not dead. There’s incredibly little to keep us going to Schuylkill. 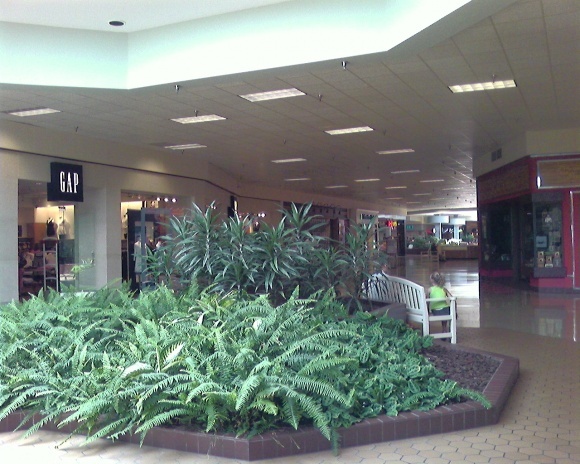 In the early 90’s, it beat the pants off SV Mall, and we willingly ran to go to it, but we only stop now if we’re in the area, and that’s not often. Pretty sad that they misspelled the name of the mall on the marquee. This is one of my favorite malls because of its old school charm and it’s willingness to survive. I too have always been surprised at the size of this mall compared to the area it serves, but I enjoy the place. I’ve been there about three times. I even have coupons for the now closed Chick Fil-A. 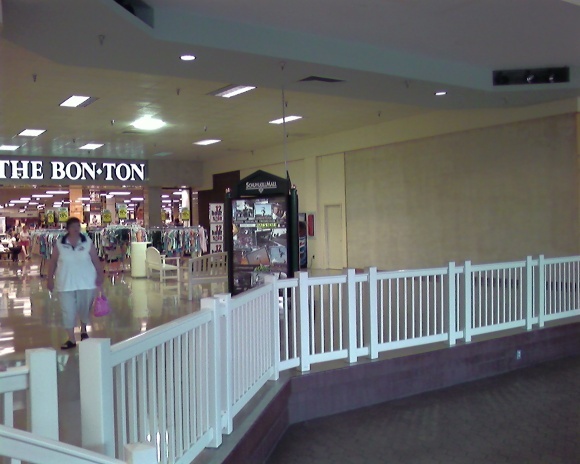 And I always assumed The Bon Ton was Hess’s, because the interior reminds me alot of the old Hess’s in my local mall, right down the the wood floors. Although I suppose it could be a coincidence. For the record, that particular Chick-fil-A franchise donated money, and it’s not particularly clear if the link you linked to was related to the closing at this mall. ‘Schuylkill’, what a funny name! Shame they closed Chick-Fil-A oh well; I kind of like the interiors of the mall, they look so outdated and old it feels like a timewarp! 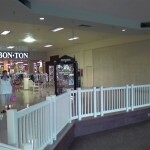 It will be a shame if Gap closes their store in this mall as part of their nationwide closures that were announced. @Nordrike Field, Schuylkill is the name of a river that flows through southeastern Pennsylvania, ultimately ending in Philadelphia. When the Chick-fil-A closes, that’s often a sign that it’s the end for the mall. Now I cannot wait for my next Chick-fil-A fix- man, it’s the best fast food! Just one correction…. If I am not mistaken,as of August of this year, the mall is now owned by an investment company, Empire Reality Investments and managed by Fameco according to the mall’s website. 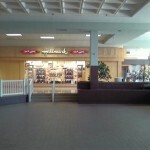 PREIT sold Schuylkill Mall a few years ago. I am a shareholder of PREIT stock (which lost 50% of its value in the past year. Yay…) and I remember that Schuylkill was one of the former Crown American properties that PREIT couldn’t wait to unload. 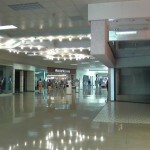 According to its Wikipedia page, Empire Realty now owns the mall. Schuylkill is a Dutch word, possibly meaning “hidden river”. The mall is named after the county it’s in and the Schuylkill River starts there. It ends up in Philadelphia where the infamous Schuylkill Expressway runs alongside it. @Bruce, What a strange mall considering it’s size vs it’s market segment. Not to go off topic, but do you own shares of Simon or Macerich? Both of those companies have stronger portfolios then PREIT. @Sean, I’m not a big investor. My stock was originially in Crown American and it converted to PREIT stock after the merger. I don’t have any other direct retail stock. @Bruce, Oh I see. Didn’t mean to get personal, just was curious. Just hang in there for now, but if your gut says sell then do so. At least they pay a dividend. 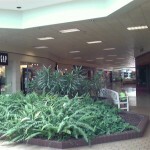 Judging from the website, http://www.shopschuylkillmall.com/ (it’s written on a sign in one of the pictures), they’re still holding events for the public like mall walking, trick-or-treating and the like. Can’t quite find anything about what we need to “keep our eyes open” for, though. 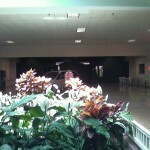 I’ve passed this blighted mall on my way on 81 plenty of times and stopped in a couple times. Very distressed and tired, the mall is a classic gem just hangin’ in there. There’s plenty of bygone area treats here including “the movies” which is likely unchanged from the early 80s. 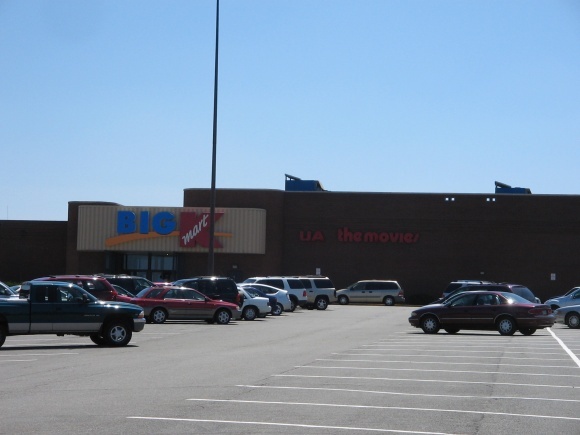 “the movies” was a miniplex once apart of United Artists brand theaters who had many outlets in malls including my local Westfarms. 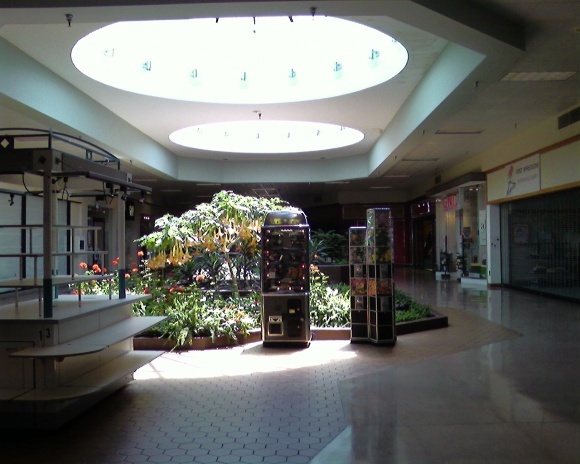 Interesting to see what it might’ve looked like at others malls seeing as it’s been “preserved” or forgotten by time in the warpzone Schuykill Mall. @The Caldor Rainbow, is that really you? Will the website ever update again? I took these starting in 2006, and have updated them over the years. 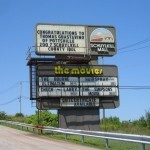 This set covers all 3 enclosed malls on that stretch of Route 61. 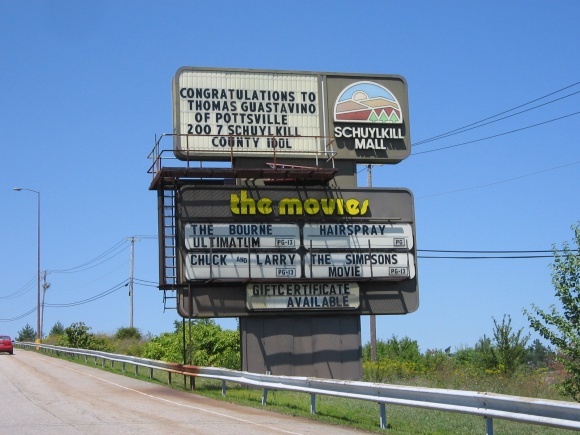 One new interesting thing at the Schuylkill Mall: the current owner of the 4-screen movie theater opened a digital 2-screen drive-in. 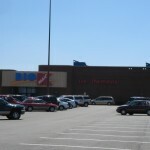 Located in the parking lots, north-east corner of the former Hess’s location, it opened in August. They’re even showing sporting events and concerts on these screens (and inside as well). For quite some time, that Chik-fil-A was the northernmost location in the chain. 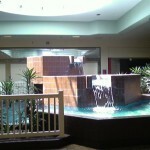 I live about 90 minutes away from the Schuylkill Mall – I haven’t been there in about 4 years. I’ll have to stop by and get some recent pics. It’s a pretty unique place in that it never has gotten any serious remodeling. And what do you know? 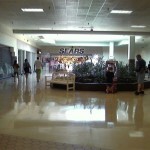 This Sears is on the list of the stores to be closed in 2012. There’s only one Pottstown. 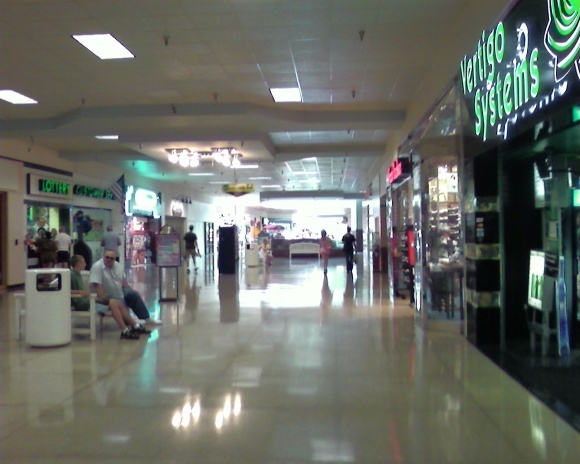 This mall is in Frackville, which is above Pottsville. No biggie, but the two are a good distance apart, just in case anyone was going to try to find this mall in Pottstown. Wow, Schuylkill Mall is lucky, their Sears and Kmart were spared, but for how long? 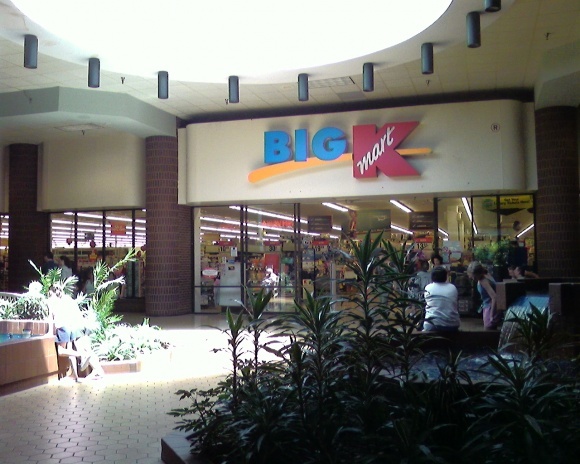 I can’t belive Sears and Kmart are closing so many stores, sad to say but they aren’t what they once were! @Nordrike Field, This doesn’t shock me in the least. 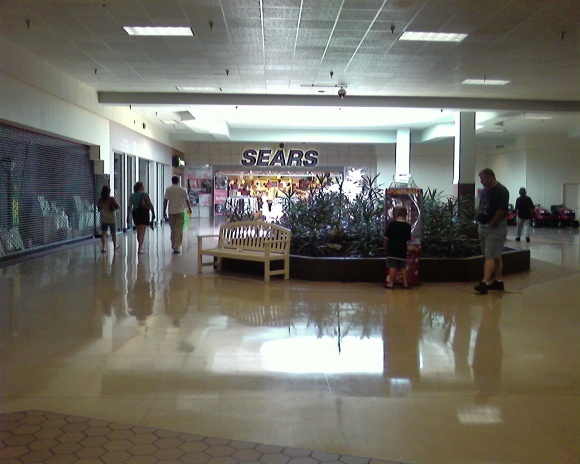 The healthy malls that currently have Sears stores will hold on to them, but marginal malls like this one may lose there Sears anchors as the company needs to shrink to survive. JC Penny, Macy’s & Dillard’s may end up following suit as it becomes harder to justify paying high rents in weaker or dieing malls. Even Sacks Fith Avenue is going through this process in some of the top tier centers in this country. Schuylkill Mall just lost a big tenant in Nirvana’s Closet. They were selling illegal substances (I can’t find the article link right now, but if you google for it, you’ll find it). They took up a lot of real estate down near K-mart. Sad. They just totally re-vamped the movie theater 🙂 it has a bar in its vip lounge that goes into 3d screenings, then they made an out door drive in theater that’s huge and just behind the mall. 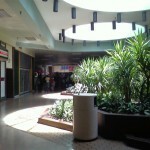 A lot of stores are still closed in it but some are new lol its a cute mall, my kids love it. Does anybody have any old pictures of this place circa 80’s or any knowledge of former stores in specific locations? For example, where the Listening Booth, Chess King, and Anderson Little stores were? I know for a fact these were here but don’t know their exact locations in the mall today. It was announced last week that Sears will be closing in early 2015. I visited the mall today. Many, many vacant spots. 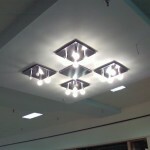 A section of the ceiling near Bon Ton appears damaged from water leaks. 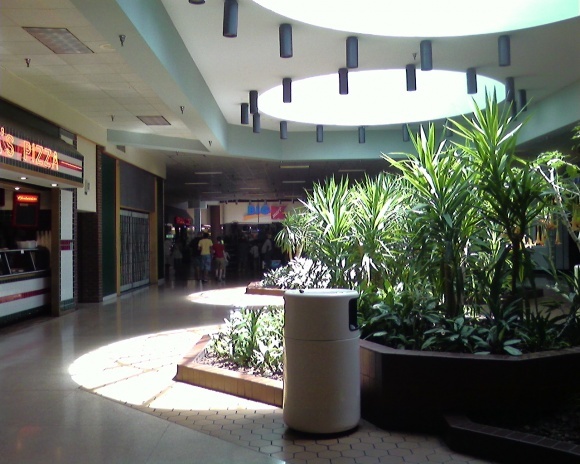 The whole mall looks really distressed. 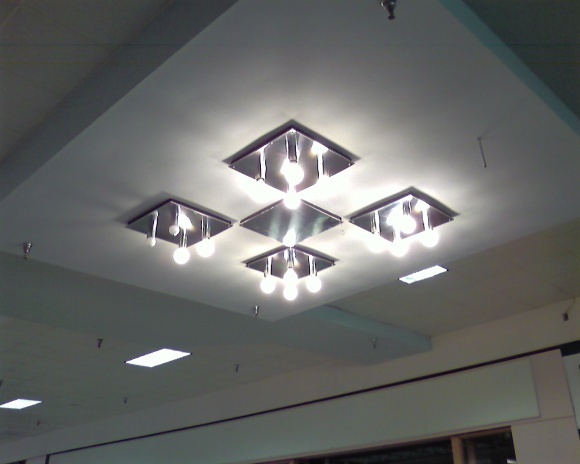 I vaguely remember the interior of the old 70’s style Spencer’s store (how it lasted that long like that with that facade boggles my mind now) I was very young and was dancing in the very back of the store where they had all of the novelty lighting. Man, I miss that store. I remember the old Pocket Change arcade, I had three birthday parties in a row there I loved it that much! They were always filled to the brim with the best arcade games (The House Of The Dead was one of my favorites) and even had a ballpit at one time. It was re-branded as “Gamer’s Alley” around 2007 and dropped in quality tremendously. I still continued to play pool in there with my buddies however, all the way up to its closure in 2014. Over in the Sears wing in the early 00’s, there was a hippy/new-age store called Avalon where I would just lounge about in for hours. The owner was extremely laid back and didn’t care if you just chilled there all day. They also sold some very interesting merchandise that always grabbed my attention, such as Egyptian sculptures and dragons. Waldenbooks, which was also in the Sears wing, I also remember very fondly. My mom would take me there all the time to get all kinds of books, all ranging from “Little Critter” books to books on or about professional wrestling. 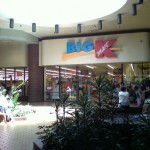 This was an original store too, and it ended up closing before the rest of the chain in 2009. I remember the vintage Claire’s store, but never shopped at it because I’m not a part of their demographic. Many Friday night dinners were eaten at the once very successful Chic-fil-A. To this day, I believe that the only reason they ended up closing was because of mall management wanting them to open on Sunday’s. I remember fairly frequently getting pizza at the old location of Suglia’s Pizza at their awesome, stereotypical 80’s restaurant storefront which was sadly abandoned for a new, much smaller location up near Dunham’s Sports. I seriously miss that location though, it had just about every attribute of a standard 80’s pizza restaurant, pictures of Italy on the wall, neon, old worn out booths, mirrored surfaces, and the smell of ciggarette smoke that was combined with the smell of their delicious pizza. I also remember coming up here almost every Friday night from 2005-2007 and hanging out with my brother and a couple of his friends. Varying on their schedule, I also started hanging out with my own buddies up here around this time. Those were some of the best times I’ve ever had up here, and I miss them dearly. There’s a few other things I remember, but what I want to see on here is other peoples memories of this mall. 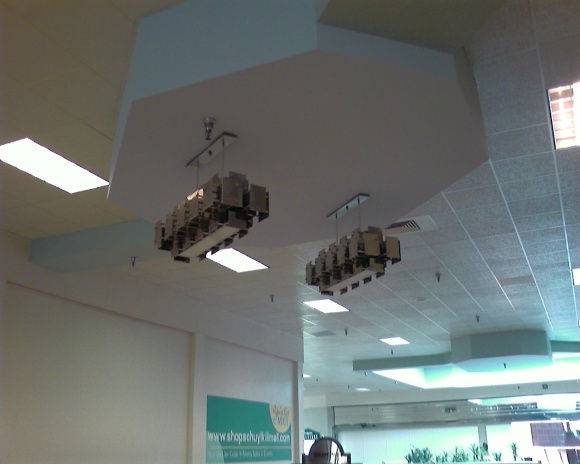 Memories from the malls heyday, anything from former store locations to personal memories or one-off, interesting facts about the place would be really cool to see. I’ve been actively interested in and practically obsessing about this mall since about 2004 (I was only six!) and I know far more about it than anyone my age. That being said, there’s so much more about it that I don’t know about and that’s where your memories will come into play. This has become my favorite dead mall/mall in general and even though things aren’t looking good for it, I’m still holding out hope that it can live again. I’m always looking things up about this place, desperately trying to find ANYTHING relating to its past. I’ve been semi-successful, finding a few old news articles and other misc. things. 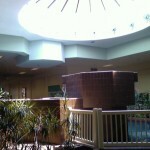 Any information would be appreciated to help refine my knowledge of this mall, so please if you have any at all comment away! 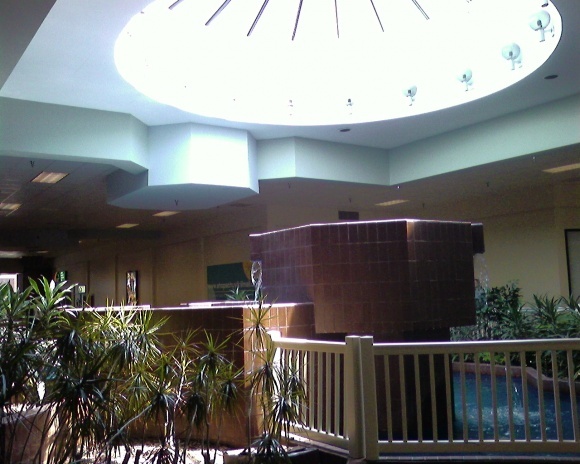 I also have to give this mall credit for getting me into this “dead mall” fandom at such a young age, because I love how I’m able to appreciate the nostalgia that these old malls give people and also just the overall architecture and everything else that makes these places unique. It also makes me long to live in the 70’s and 80’s when these places had plenty of life, and places like arcades and record stores were still popular. 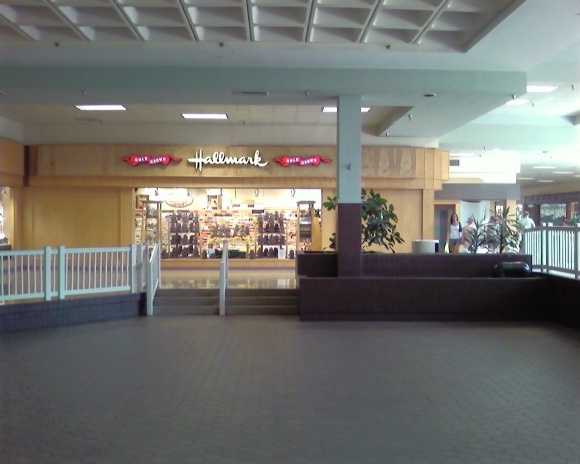 Oh and one last thing, just thought it would be neat to mention that I’m actually the original author of the mall’s Wikipedia page. It wasn’t the best article and could probably do better job at it now, but I’m glad that others have drastically improved it since I originally wrote it in August 2011. I’m still proud that I wrote it though, because without me there wouldn’t have been an article to improve on in the first place. I forgot to mention that I try to support this mall in any way that I can. I tend to spend a decent amount of money in the malls fye by buying heavy metal, classic rock, and grunge cd’s, t-shirts, and sometimes DVD’s. 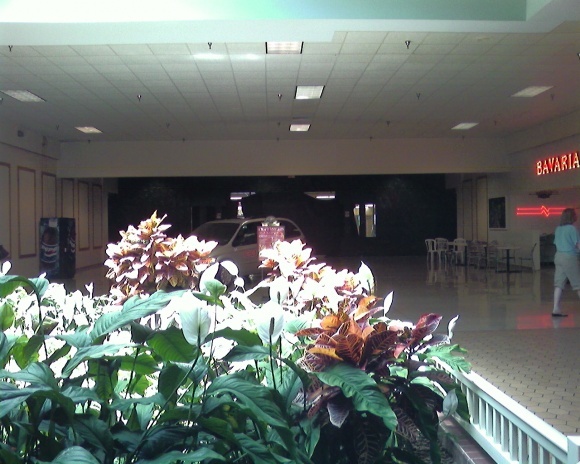 Alot of the times though, I don’t have all that much money, but I still do anything I can to keep my favorite dead mall open. Fye is pretty much the only inline store I could do this with at this point sadly, but I gladly give them business. I also shop at the only unique store at the Schuylkill Mall, Black Diamond Antiques. I buy vinyl records, retro video games, VHS tapes, DVD’s, and anything else that grabs my attention. 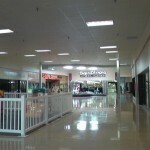 I hope that, if the mall does come to a close, (:() that Black Diamond will move to a standalone location somewhere else in the county because it is seriously an awesome store, and it would be a shame to see it go with the rest of the mall. 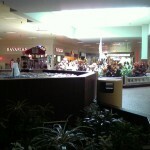 This mall will be closed soon, and the rumor is that the new owners will be knocking it down. I have photos from last week and today if you would like to see them. Pearl Theatres, AT & T, Suglia’s Pizza, and Dunham’s Sports are a few of the stores left. Bath and Body Works and Victoria’s Secret left recently. That wing is pretty much empty. The auction place still holds auctions on weekends. There was a used book sale in the former Gap this weekend so that got people in the door. I just saw a movie in the VIP (21+ years old) theater, it’s very nice and pretty new. It’s a shame they need to leave. I’m not sure why the new owners can’t work something out with them. The new property owners claimed they wanted to ‘help the community’ when they first purchased the mall. Such liars.